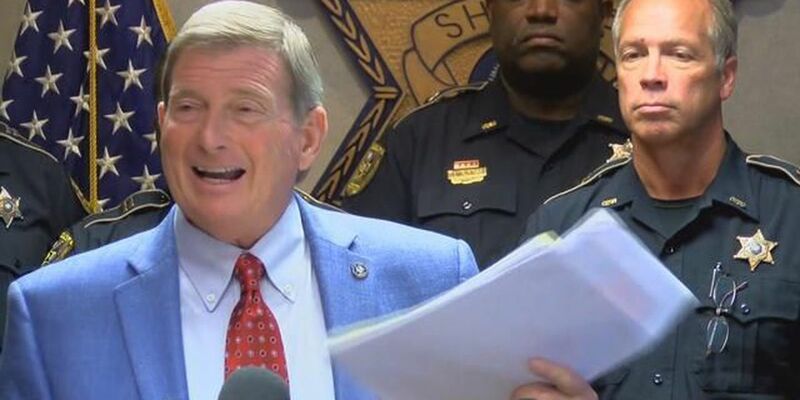 CADDO PARISH, LA (KSLA) - Standing at a podium, inside the Caddo Parish Courthouse, Caddo Parish Sheriff Steve Prator uttered the words during a press conference that would spark a controversy. "In addition to the bad ones, in addition to them, they are releasing some good ones that we use every day to wash cars, to change the oil in our cars, to cook in the kitchen, to do all that where we save money," Prator said. Prator had spent more than twenty minutes questioning the public safety aspects of new state legislation, called the Justice Reinvestment Act, meant to reform Louisiana's criminal justice system. Read our original report here. "We don't need to do what we are about to do," Prator said. The Sheriff said he wasn't against reform, but his major concern with the new law is that it would release a score state felons from Parish jails like his own before their full sentences were served. Some "bad dudes" were going to get released from jail in November, that Prator felt should remain behind bars. "Certainly we need to take our time, and do like some of the other states and have some programs to work on rehabilitation before we just open the gates and flood the street with some of these people that don't need to be out," Prator said. Yet when the Sheriff eventually focused part of his comments on the cheap labor some of those inmates provide, his press conference made national headlines. The Sheriff’s critics saying his remarks evoked slavery and sounded racist. Prator strongly denied those accusations. Cindy Chadwick, the public information officer for the Caddo Parish Sheriff's Office, said the remarks causing controversy were taken out of context, saying anyone listening to Prator's full press conference would know he never once mentioned race and anyone suggesting the Sheriff is racist is absolutely wrong. But Prator's remarks regarding prison labor raised the question of whether those final comments were motivated by the color of money. One goal of the new criminal justice reform legislation is to reduce the state prison population by 10%. Louisiana has the highest incarceration rate in the world. Many of those state prisoners are imprisoned in parish jails. Because Prator's jail, like all other parish detention centers housing state inmates, receive money from the state for locking those inmates up, his office could lose a lot of money if prison population reduction rates are met. According to the Louisiana Department of Corrections, Parish jails get a per diem of $24.39 for each state inmate taken in. A 2016 Legislative Auditor’s report showed the Caddo Correctional Center (C.C.C.) grossed more than $4.6 million dollars housing state prisoners. It’s the jail’s third largest source of income. When Prator held his courthouse press conference, 355 state inmates sat in his jail. Under the new law, Prator says 35 of those state prisoners will go free November first. and 28 more inmates will be released later in the month, for a total of 63 state prisoners walking early from C.C.C. Based on the state per diem, this first wave of releases could cost Prator's budget more than $46,000 in December alone. Moving forward, if the law reaches the eventual goal of reducing Lousiana's prison population by ten percent. C.C.C. can expect to lose 35 daily state inmates. Potentially dropping the jail's revenue over $300,000 annually. As the sheriff pointed out himself, his office also saves money by having state inmates work. While locked up, they pick-up trash, clean parish facilities and perform other jobs, like vehicle maintenance for free. Plus Prator, like some other parish sheriffs, run work release programs, hiring out eligible inmates to private companies, and taking up to a 64% cut of the prisoner’s wages. The state also pays the jail $14.39 per day per work release inmate, to house them. In 2016, according to a State Corrections report, the average work release inmate at C.C.C. earned the jail $13,887.64 a year. If prison reduction goals are met, Prator stands to lose 10 work release inmates, potentially costing the jail close to $140,000 next year, money the sheriff says he uses to keep the prison running. "I don't want state prisoners," Prator said. "They are a necessary evil to keep the lights on." But prison reform advocate Clive Davis, a former state inmate said he thinks prisoners in work release programs show the capability of rehabilitation. Davis saying their labor shouldn't be used to fill a line item on a budget. “He said they want to keep these guys because they’re more beneficial to the parish or the state,” Davis said. “Why wouldn’t we want that type of person back into the society."